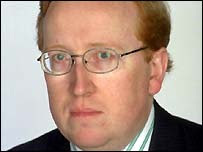 At times, Simon Heffer is a very nasty and aggressive journalist whose efforts invite easy ridicule. His hatchet job on Boris Johnson immediately prior to to the London mayoral election conveniently omitted to mention his own role in fomenting one of the greatest crises of Johnson's career, and how Johnson's actions might have shielded him from his due measure of public opprobium. Yet, in yet another of his tedious attacks on David Cameron's apparent lack of ideological purity - the intensity and regularity of these attacks make one wonder whether Heffer is either an obsessive or just another petty authoritarian who'd have gone far on the Committee of Public Safety, one of life's natural park-keepers - Heffer stumbles across a possible key to unlocking public understanding of Gordon Brown. With a typical lack of charity, he describes Brown as being, "a terminally wounded, uncharismatic introvert with a selection box of personality defects and you start to see the answer. " Indeed - he's from the same mental mould as Richard Nixon. One doubts whether he cries in front of a portrait of Nye Bevan in the same way Nixon cried in front of Lincoln's; but just about everything else is there. Pity Heffer couldn't make the connection. Thanks Martin - I'm going to look into Mr Heffer further after this. I've thought the same about Gordon Brown for some time, having read and lectured about Nixon for years. In fact, I mentioned the thought to an American audience last year, just before Brown took over. There are around five similarities that immediately spring to mind I suppose. One is just the general earnest Scots-irishness, as the Americans would call it. Nixon had as much of a claim to Celtic heritage as Kennedy, but it was an Ulster/ West Scotland one I guess, with all that implies. Secondly, there's the unpopular war that split his own side and his opponents; the Keynesianism at the start of a stagflation era; the obsession with a handsome, cavalier predecessor responsible for most of his troubles who stole an election from him in his mind; and the complete and justified distrust of most of his colleagues' competence and stamina. There's surely a disappointment that hangs around all politicians who are competent and at the op of their game when they reach the highest office long after they should have done. In Brown's case, I notice he is being blamed for oil, food and mortgage problems he had nothing to do with. The difference is that Nixon built a Republican majority on the basis of social division that lasted nearly forty years and is only just passing; even in his worst moods, I can't see Brown, who seems to want to be decent, doing that. With all due rressppectt...shorryy, had a couple of gla...glas...glashesses of fortified grape juice with dinner...it's difficult to see how Brown could be painted as being anything other than the the father of our current feast of problems. He was the most powerful Chancellor this country has ever had - indeed, if we're hunting American analogies it wouldn't be at all out of order to compare Brown's hold over Blair's Downing Street to Cheney's hold over the Bush White House - and he must bear a measure of responsibility for every deferred decision currently going wrong. And as far as having handsome predecessors is concerned, LBJ was no oil painting. I meant JFK, whom Nixon was obsessed with. maybe Lyndon Johnson and his tank tactics are a better comparison for Brown. I take your point about Brown as Chancellor, but he was politically powerful; economically, his achievement was not to be seen to mess up, and also not joining the euro. What he should have done was not sell the gold, find some magical way of stopping people who hadn't a clue about investment from 'investing' in houses and using the ephemeral rise in wealth to take out credit. He should then have successfully resisted the greens, ignored the global warming agenda, and built a ton of nuclear power stations whilst investing in plasma containment for when the oil started to seriously run out. Then he should have totally reeducated the Labour Party to accept a mix of public ownership of transport and infrastructure, and health insurance whilst effectively opening hospitals and schools to market diversity. And then he should have paid down the national debt by taxing the rich. He couldn't. I think not even if Cheney hooked his fifteen pacemakers to the zx spectrum chip controlling the American media's brain could the Vice-president have been that influential. I hope you enjoy your wine. I like wine, and am currently drinking something from morocco. Give us a few hours and I can ball my fist and start making imaginary Nixon asseverations to a 'Henry' vacuum. Tee hee, Martin M - enjoy the wine.